The Waste Management Department of Dubai Municipality is gearing up for the launch of Clean Up the World campaign 2010 during the month of October. The activities of the country's largest voluntary clean up drive, which is in its seventeenth year, will be officially announced during a press conference later this month. Dubai Municipality is keen to participate in the annual event with various cities in the world in order to disseminate environmental awareness and education in the community to maintain the cleanliness of the environment through active and meaningful participation. It is expected to launch the campaign with the participation of many educational institutions and local departments and various sectors in the emirate and those interested in environmental protection. This was stated by Hassan Makki, Director of Waste Management Department and the Head of the Clean Up the World Team. He said the department is getting ready for the official announcement of the campaign and the events and associated activities during a press conference to be hosted by hotel Dusit Thani, key sponsor of the campaign. "We have decided that the campaign slogan for this year will be "Communities Care for the Nature." Makki said that this annual event is considered integral to the functions of the Department on environmental issues and in addressing them and raising awareness and disseminating right environmental culture among the members of the community in the Emirate in light of the worsening environmental problems which has become a danger to the health and safety of the society. He noted that the Clean Up the World is a global environmental campaign and is one of the most important awareness campaigns organized every year worldwide by Clean Up the World, the Australia-based Programme and UNEP, which aims to gather volunteers to work together for a massive campaign to clean up the environment together with a focus on raising awareness of decision makers and local and global communities on issues related to the environment and develop strategies for the sustainable management of waste. Hussain Ghulam Hussain, Head of Administrative Support and Customers Section and General Coordinator of the campaign said the Clean Up The World has, over the past years, achieved positive results in educating young people the importance of maintaining a clean environment and developing their knowledge and providing them with comprehensive concepts for the environment to be able and qualified as leaders of the future for volunteering in the environmental field. More than 6,000 students from various public and private educational institutions in the Emirate of Dubai, and more than 8,000 volunteers from the staff of government and private sector companies have participated in the events and activities of the campaign last year. 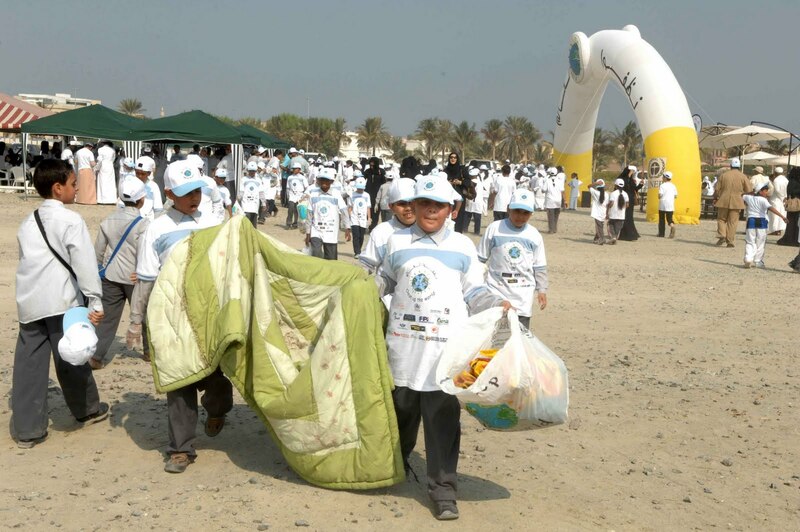 The campaign has also succeeded in raising the level of environmental awareness and growing a sense of social responsibility among many members of the community and strengthening the role of educational institutions in the emirate in participating in such voluntary environmental campaigns organized by the Waste Management Department annually. Abdullah Al Ghafari, Head of Customer Services Unit in the Waste Management Department said the Clean Up the World campaign provides the right platform for all segments of the society to participate in an environmental event of utmost importance that focuses on the importance of joint work between different sectors, various local departments and educational institutions to achieve its noble objective of a cleaner local environment and develop the spirit of volunteerism among all members of the society considering that cleanliness of the environment is one of the priorities and responsibilities of individual members. The campaign comes within the framework of the Waste Management Department to introduce the community of its responsibility towards the environment and maintaining cleanliness and environmental awareness among all members of the society to reach the long-term aim of an enlightened society that has marked the details of its daily life with sound and positive environmental practices and behaviors thus achieving the objectives of the Waste Management Department towards maintaining a clean environment and the vision of Dubai Municipality of creating an excellent city that provides the essence of success and comfort of living.